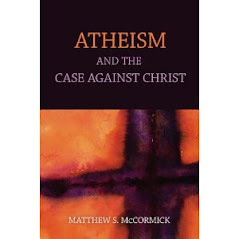 Atheism: Proving The Negative: Good News: Prometheus to publish my book, working title The Case Against Christ. Good News: Prometheus to publish my book, working title The Case Against Christ. Prometheus has agreed to publish my book about Jesus' resurrection. Tentatively, we'll be working on final revisions of it for the Spring 2012 book season. More details as they develop. Fantastic! I started to think something went wrong since you hadn't talked about it in a while. Make sure it comes in a Kindle version, as well! Awesome, it will be really exciting to pick up a copy. Wow! Congratulations professor. I've seen you debate on the subject and you definitely know what you're talking about. I can't wait to order my copy. Will pre-order as soon as I can. Congrats. Congrats! A nice publisher; our own Nathan Salmon has a book with them too. Looking forward to the release! Excellent - looking forward to it already! That's good news. It's just a pity it's so long away. Wow, congratulations. They're a great publisher. I look forward to reading it. I cannot wait to read it! Your insights are brilliant, and thus, are sure to deepen and sharpen my own cognitive abilities. I am very glad I found your blog professor!